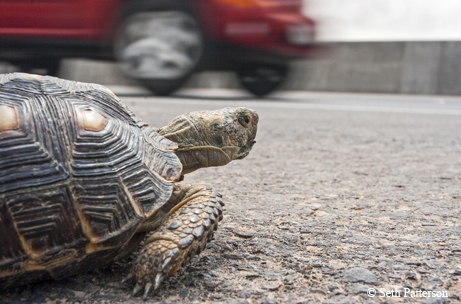 ﻿﻿﻿﻿﻿Already threatened, Texas tortoises face danger from roadways. Driving on U.S. Highway 281 in South Texas, I slammed on my brakes and jumped out to see if it was still alive. Just as I feared, yet another Texas tortoise was dead on the side of the road. My colleagues had sighted several tortoises moving in the area the day before, but as my luck (or perhaps the tortoise’s bad luck) would have it, all the tortoises I found that day were roadkills. Within the next few days we found seven — some dead, some alive. With their high-domed shells, scaly legs and curious gait, Texas tortoises are unique and beautiful creatures. North America has four of the world’s 45 or so tortoise species, but here in Texas we have only the Texas tortoise, or Gopherus berlandieri. The Texas tortoise, once heavily collected for the pet trade, is on the state’s list of threatened species, which prohibits its capture or sale. Gopherus berlandieri is the only tortoise species in the country not federally listed under the Endangered Species Act. During our field season between March and October of 2014, my group of researchers at Texas State University surveyed the eastern and northern portion of the tortoise’s range. This research, funded by the Texas Parks and Wildlife Department, sought to evaluate the presence of Texas tortoises in those regions, where recent sightings have not been reported. This represents an area just south of San Antonio. The tortoise’s full range stretches over South Texas and northern Mexico. We drove more than 20,000 miles (almost the circumference of the Earth!) during this period and found only those seven tortoises along the roads. We used this data and added reported public tortoise sightings to create a map showing suitable habitat for the Texas tortoise. We found that parts of the area surveyed could potentially be suitable despite not finding many tortoises. The 32,000 miles of roads that run through prime tortoise habitat represent a major threat to this species. About 6 million vehicles are driven on these roads every day, and there are more than 4 million acres with deer-proof fencing south of San Antonio. These obstacles act as barriers to tortoise movement. If you do find a tortoise on the side of the road, help it cross the road safely but do not take it home. It is illegal to possess a tortoise without a valid permit. Please post any sightings of a Texas tortoise to www.inaturalist.org/projects/texas-tortoise-survey to help improve our study.